Considering the recent high-profile retirements of Will Take Charge and Palace Malice (we know, he may come back to race again in 2015), this year's running of the Grade 1, $1 million Jockey Club Gold Cup could really have taken quite a hit. In some ways it has, as despite drawing a field of 12, there are few truly top-flight handicap horses entered. That does not mean that it isn't a fun and interesting race to handicap, however. With the top three finishers from the Grade 1 Travers, for 3yos, stepping up here to take on arguably the top handicap horse on the East Coast in Moreno, we do have an intriguing matchup awaiting. And there is quite a lot going on just among those four horses, so let's get to work. 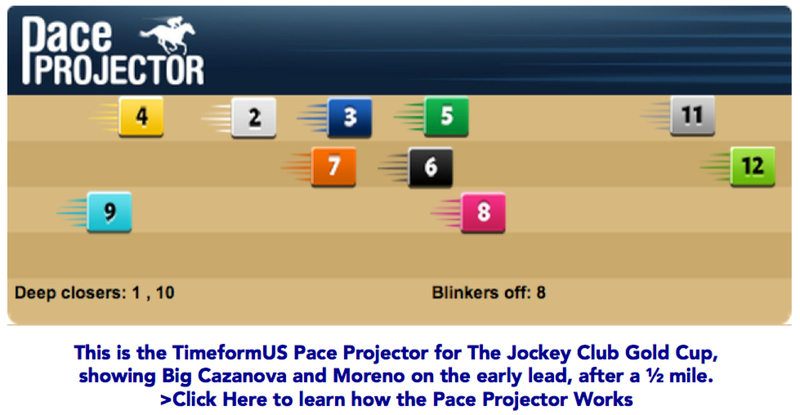 Pace Projector doesn't favor either frontrunners or closers in this race, but it does rather nicely lay out one of the main themes of the race. With Big Cazanova shipping east off of a pair of gate-to-wire wins vs. lesser competition at Del Mar, and his being fast enough to make the early lead in this race, how much will the pace-inclined Moreno be compromised? That is a question to be answered on the racetrack Saturday afternoon, but the connections of Moreno cannot be happy to see Big Cazanova entered. #1 is Micromanage. He has seemingly been carving out a niche in the dirt marathon ranks this year, and, as unsexy as that division is, has been doing a pretty good job of it. With Team Pletcher's Breeders' Cup cabinet growing thin, he will take a shot at a bigger prize here, but it is one that he will likely find beyond his reach. #2 is Last Gunfighter. A gutsy and admirably consistent horse, he has a way of showing up every time and running his race. He has earned some TFUS Speed Figures that make him very competitive with this field, but he tends to run those races vs. lesser horses. He has failed to match up to Grade 1-level horses throughout his career, and, as much as we like him, he has already been exposed as something less than top class. #3 is Wicked Strong. The first of the 3yos stepping up here, he dropped a heartbreaker in the Travers after holding a clear lead in the late stages. Always a handy kind of horse, he has displayed enhanced tractability since blinkers were added two starts back, which helped him to get the better of his 3yo rival Tonalist in both starts upstate. He earned a new top TFUS Speed Figure of 111 in the Travers. From our point of view, he still has more upside, and, despite getting the best of the trips both times at Saratoga, he is a prime contender. #4 is Zivo. 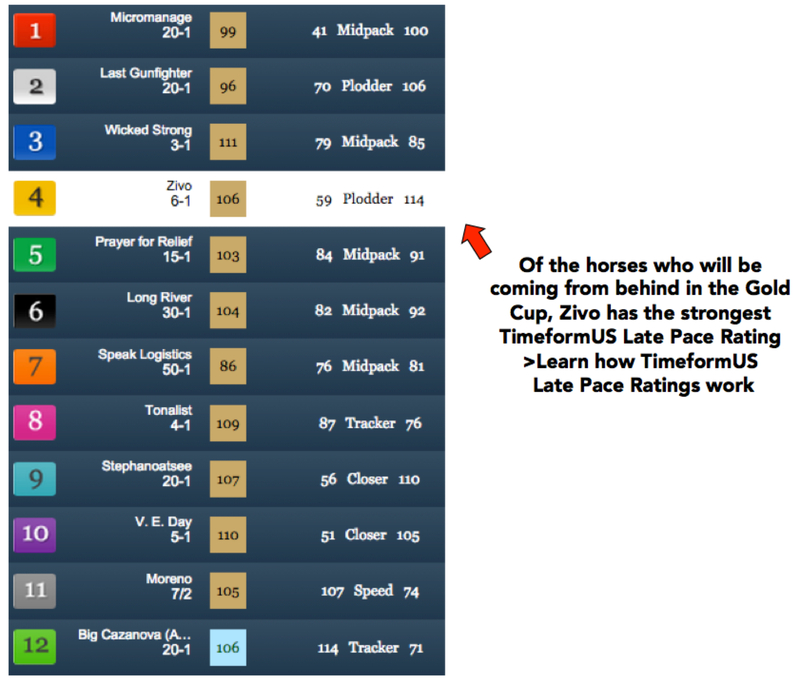 A dangerous closer this Zivo is, packing a big 114 Late Pace Rating, which stands out in this field. He has been on a seriously strong run for Chad Brown dating back to the end of last year, winning 7 of his last 9, including the Grade 2 Suburban over this track and trip. He caught a solid if unspectacular pace to close into that day, but he saw out the 10 furlongs without issue and had little trouble carrying his run by, among others, Moreno. He wasn't quite able to close enough ground behind that rival last time, but that race was run over a Saratoga main track that was very kind to speed (note the Race Rating box shaded in dark red), and Zivo never stopped running while down on the rail all through the stretch. Any pace that develops out front is going to help him, and in his last two starts, he has proven his worth in races like this. To us, Zivo is a major player in this race. #5 is Prayer for Relief. There is not much to knock about a horse who has put almost $2 million in the bank, and, like Last Gunfighter, he has a way of showing up with a representative effort every time. That effort is generally not going to be good enough in a race like this one, however. He has had good trips in each of his last two starts and has done his best with them, but he is going to require a few of his rivals today to show up with something less than their best. #6 is Long River. Yes, we liked him last time. To us, he had the look of an improving horse who had his form dirtied up by a couple of tough trips heading into the Woodward, and we were willing to give him a chance to pull off the upset. We were wrong. He was able to keep himself in range of the top two finishers through much of the running of the Woodward but came up completely empty in the stretch, and it is more difficult now to make another excuse for him. #7 is Speak Logistics. He is, to put it mildly, in way over his head in this race. A talent from day one, he has never taken a backward step on our figures (86-88-94-100-104-105-109). He handles distance without issue, as evidenced by his Belmont Stakes victory over 1 1/2 miles during which he carried all of the ground while racing wide throughout. He is two-for-two, both in graded stakes, over this track. Defeated both times by Wicked Strong at Saratoga, he certainly appeared to be prepping in the Jim Dandy, and then, simply put, he got the wrong ride when going after the speedy and talented Bayern early on in that fast-paced Travers. Despite his already being a classic-winning 3yo, we've been waiting patiently for Tonalist to properly break through, and Saturday may well be the day. #9 is Stephanoatsee. A deep closer who has never been particularly effective in graded stakes company, he will be hoping for a pace collapse, and even then is unlikely to pick up more than a minor award. #10 is V. E. Day. Travers hero is 3-for-3 on dirt, and has yet to run a poor race though six career starts. He is a deep closer, but there is no lack of pace in this race, so he should not be badly compromised by dynamics. He has taken advantage of circumstances a bit in his last two wins, particularly in the Travers with that fast pace out in front, and he was given a flawless closer's trip by Javier Castellano to get it done. However, because he has delivered every time, and is likely to once again be the best price of the 3yos in this race, we will not knock him. If you like him in this race, and there are indeed things to like, he will likely be available at a reasonable price. #11 is Moreno. Let's be clear about this. As things currently stand, this is the best horse in the Jockey Club Gold Cup. 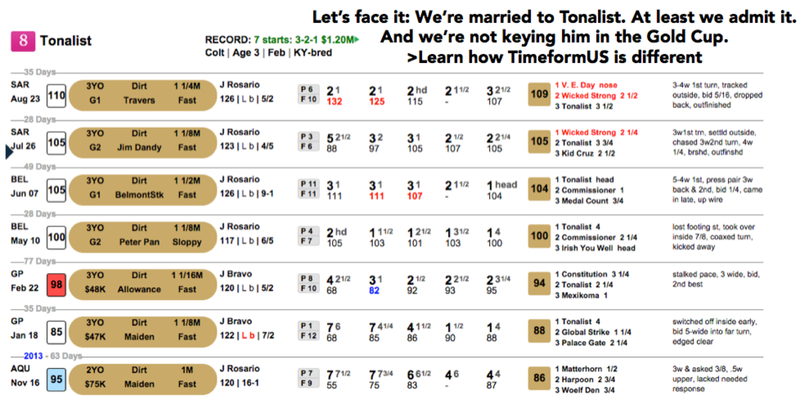 He is the fastest horse, with TFUS Speed Figures of 112 and 114 for his last two races, and he is quite a bit better than anything the 3yos have ever had to run against. The issues for Moreno are: 1) the presence of Big Cazanova to his outside. And 2) The fact that 1 1/4 miles seems to be pushing it for him. If he can get comfortable in the early stages of this race, either by grabbing control from the start or by tracking along off a horse who he appears to simply be better than, then he will be a handful for these horses to run down. He may well have some trouble seeing this thing out, but to us, he is the horse to beat. #12 is Big Cazanova. A wildcard who appears to just be taking a shot in a major race, we don't like his chances to be around at the end of this race, but that doesn't mean that he won't play a major role in the outcome. If nothing else, he has speed, and since he also has a tough outside post, he may have no choice but to use it. Win or lose, he may be just enough of a thorn in the side of Moreno to make it tough for that horse to run up to his very best, and Moreno may need his very best over this distance. We greatly respect Moreno in this race, and we think that the 3yos all have realistic chances to be this good. However, we are taking Zivo to win this Gold Cup, and since he figures to be no better than the fourth choice in the wagering, he is going to be our key. We will bet him to win, and will use him with Moreno, Tonalist, and Wicked Strong in exactas. In the Late Pick 4, we will press Zivo and Moreno, and relegate the two 3yos to backup status.